Are you looking for a pair of the Nike Tiempo Legacy Football Boots, well we have you covered. The following post has everything you need to know before buying a pair. If you haven’t heard of Nike then you’ve probably been living under a rock for the past 30 years. Having dominated the sporting good markets in most fields, Nike has also channeled their fair share of resources into producing goods for the world’s most popular sport, football. With football boots being the most sought after football product. Over the years, Nike has released numerous boot versions through its popular Tiempo line. Since the 1994 world cup where 10 players in the Brazil-Italy final wore Nike branded boots, the company has risen to considerable dominance in a market that was previously dominated by Puma, Hummel, and Adidas. As a sign of confidence in the Tiempo boots, they are endorsed by football greats Ronaldinho and Sergio Ramos among others. In December 2013, Nike released the Nike Tiempo Legend V, which were received well by the market by the market. These boots looked the part and offered superior performance. But there was a problem, the boots retailed at a premium price. This led to the birth of the Tiempo Legacy Football boots. This mid-tier boot was based on the much loved Tiempo Legend V. Retailing at half the price the Legacy offers a viable alternative for those who can’t afford the premium Legend VI boot. In fact, Nike did such a good of a job, it’s almost impossible to distinguish the two models on appearance. Nike put a lot of effort to ensure the first wear of the boot felt right, adopting the X1.1 feature to improve comfort further. This feature was borrowed from the Nike Hypervenom Phantom. The X1.1 feature ensures the boot has a natural fit by making the boot’s toe box narrower than the forefoot. This enables the boot to have a tighter feel to a leg. While the boot needs some break in time, it isn’t uncomfortable at the first wear. The break-in time just allows the leather to stretch width wise to have a better fit. The legacy comes with a calfskin leather upper, unlike the Legend VI which comes with Kangaroo leather upper. While the difference is there, it isn’t so big of a gap that the Legacy can be considered too inferior to the Legend VI. It’s safe to say the upper leather is almost as good as you can find on any leather model in the market today. Legacy comes with a Hypershield liner which adds to the comfort of the boot not only due to its soft nature but also the ball feel it gives to the player. Other elements engineered towards the comfort of the Legacy boot include padding of the heel with synthetic leather, synthetic leather tongue, removable foam inner sole, and a flexible soleplate which is ideal for running. For a long time, the weight of a boot has been an issue in football, especially with the traditional leather boots. However, this is not a problem for the Legacy. The Legacy, like the Legend, weighs in at an impressive 8.8oz. As a result, the boot gives allows for a natural feel when striking without the weight that pulls the player down. As with weight, the traction is the same as with the Legend VI. The Legacy has a similar stud pattern with eight conical studs at the forefoot and four studs under the heel. The stud pattern results in effective pressure distribution which is key to the safety of the player. Also, the upper leather of the Legacy is padded giving the player some protection to the top side of the foot in case of being stepped on. Also, it features a lined plastic heel which absorbs some of the blow in case of a heel kick. The legacy is a well-thought out boot and the use of high-quality materials makes it great value for money. The simple design expands the boots lifespan, with very few wear and tear issues. Also, the Legacy handles wet conditions well as the Hypershield liner helps the upper to dry faster. Like with any genuine leather shoe, the Legacy boots need some maintenance to last longer. Besides taking care of the leather, playing on the right surface will aid in the longevity of the boots. The FG model of the boot is purposely made for natural grass grounds. But if you play on artificial grass, make sure you wear the AG stud configuration boots. 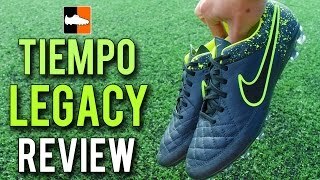 Surprisingly you can get two pairs of Tiempo Legacy’s for the price on one Tiempo Legend VI. 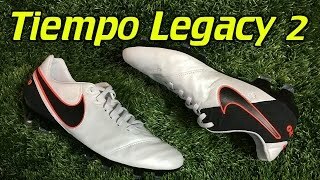 The Legacy should be treated as a quality boot in its own right rather than a cheaper version of the Legend boot. Below are a few of our favorite reviews from some of the best boot reviewers out there. This entry was posted in Nike Tiempo Football Boots. Bookmark the permalink.